Davids’ first constituent office to be in Overland Park – Welcome to Wyandotte Daily! 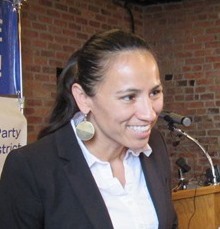 Sharice Davids, who was elected to the U.S. representative, 3rd District, post in November, has chosen her first office to be at 7325 W. 79th St., in a space previously occupied by Rep. Kevin Yoder. She will keep the same office and telephone number to make it easier for constituents to find and access the help they need, according to a news release from Davids’ staff. Davids has begun the process of opening a second office in Wyandotte County, according to the news release, which says more information on it will be announced when it is completed. Her district offices will help constituents with backlogged veterans’ benefits, Social Security and Medicare issues, stalled tax refunds, passport issues and other concerns residents may have with the federal government. The Davids’ office in Johnson County will open at 8:30 a.m. Monday, Jan. 7, and will keep office hours of 8:30 a.m. to 5:30 p.m. Monday through Friday.